Produced and published by Recorded Publications Co.
Director: J. Funicello; no other personnel listed, but there is a photo of the group. 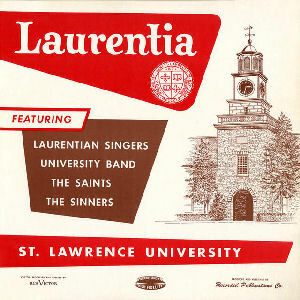 This LP features several other SLU music groups including the Laurentian Singers, Sinners and University Band and was produced as a promotional tool for the University. It is unclear whether the exclamation point is part of the title as while it appears in the title on the LP labels, it does not appear in the title on the front of the LP jacket.